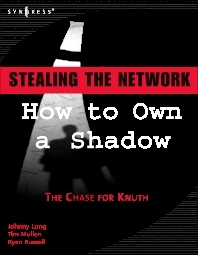 Stealing the Network: How to Own a Shadow is the final book in Syngress’ ground breaking, best-selling, Stealing the Network series. As with previous title, How to Own a Shadow is a fictional story that demonstrates accurate, highly detailed scenarios of computer intrusions and counter-strikes. In How to Own a Thief, Knuth, the master-mind, shadowy figure from previous books, is tracked across the world and the Web by cyber adversaries with skill to match his own. Readers will be amazed at how Knuth, Law Enforcement, and Organized crime twist and torque everything from game stations, printers and fax machines to service provider class switches and routers steal, deceive, and obfuscate. From physical security to open source information gathering, Stealing the Network: How to Own a Shadow will entertain and educate the reader on every page. This book is written for everyone in the Hacker and Infosec communities as well as technical hobbyists and tinkerers who have a burning desire to figure out how things really work. The Hacker and Infosec communities are tightly-knit groups where the authors of this book are extremely well known and command a great deal of respect and recognition.